Maybe you’ve been considering artificial grass for a while now, but weren’t sure which artificial turf was best for you. No worries, I’ll cover everything you need to know about artificial grass. Trust me, there’s an artificial grass out there to meet your needs. Let’s get started! Whether you’re just starting your research into artificial grass or you're ready to make that big purchase, this guide is here to help. There are plenty of reasons to choose landscape artificial grass. To be honest though, the best reason is because it’s beautiful. Let's face it - water can be expensive, and if you live in an area that experiences drought, it’s not always readily available. Not only that, but constant lawn maintenance can be a drain when all you want to do is enjoy your outdoor area. I say, spend less time caring for your lawn and more time enjoying it! This is where artificial grass comes in. It stays green all year round and requires very little maintenance. That means no wasting water and no pushing lawnmowers during hot afternoons! Aritifical grass is for enjoyment, simple as that. What is Landscape Artificial Grass? Landscape turf is a little different than other types of artificial grass. It has certain qualities that make it perfect for your lawn. Most fake grass for landscape will look like real grass blades. Manufacturers are working hard to make artificial turf look and feel more realistic than ever before. Artificial grass mimics real grasses found throughout the United States. For example, artificial grass that looks like bermuda grass is popular on the West Coast. Landscape artificial turf is also UV stable and often heat and frost resistant for high durability. It’s made to last outdoors for a very long time! It’s also perforated for drainage and it tends to be more dense and plush than other types of artificial turf. That means the turf won’t get soggy under heavy rain. Landscape artificial turf is also used indoors or outdoors. Usually, indoor artificial turf is low-pile and not as realistically made. It can even come in different colors! This landscape turf is temporary or installed on patios and is typically not used for entire lawns. Maintenance Free: One of the best things about artificial grass is that you don’t have to mow or water it. The heat-of-the-day labor is gone for good. Up-Front Expense: Buying and installing artificial grass can get expensive. You need accessories and time to get the perfect lawn. We like to think it’s worth it though. You’ll find in the long term, it’s actually cheaper! Heat: When the heat rises, so does the temperature of your artificial turf grass. There are turf fill products to help keep the temperature down, but artificial grass is hotter to the touch than real grass. Pet turf is perfect for your four-legged furry friends to have fun in! Artificial grass for pets is safe for animals and gives them a comfortable green space to roll around on. Artificial grass for pets can range from grass that’s great for lawns to fake grass that's great for balconies or indoor areas. Whether you’re looking for an artificial grass lawn or fake grass potty area, there’s a pet turf for your needs. Using artificial grass for dogs and pets has several benefits over using the real stuff. Many of our landscape turf rolls are made intentionally with a slight curl and flatter blades, making them more pet-friendly. Your pup will love rolling around in a soft bed of fake grass without pricklies poking at him. Our pet turf ensures that your backyard is a haven for your dog. The best part? Fido can run around all he wants without tearing up your grass, tracking mud in the house or catching fleas and ticks. Artificial grass is durable and less inviting for dogs to dig, not to mention you won’t see the usual brown spots where he chooses to relieve himself. Also, you won’t have to worry about watering grass or filling in holes of buried bones. Bacteria-free play area: A concern with real grass is bacterial buildup in your dog’s favorite bathroom spots. Eradicating bacteria that seeps into the soil can be difficult and unsafe for pets or kids. A great thing about synthetic turf is that it has perforations to drain those liquids. Our pet turf actually drains more than 30 inches of rain per hour per square yard! Non-toxic: Relax knowing your pet is playing on safe turf – no lead, heavy metals or chemicals found here! So you want to buy putting green? We’ve got putting green. Don’t’ succumb to the temptation of buying putting green carpet on Amazon and expecting your golf ball to roll true. Instead of green felt, what you want is artificial grass. Artificial grass is the best choice when it comes to putting practice, and the closest to being out on the range. 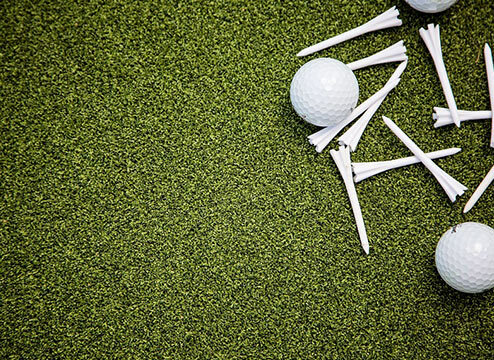 If you’re looking to perfect your short game, learn a bit more about artificial putting green. There are other qualities to putting green as well. If you’re not sure what face weight, pile hight and stimp readings are, keep reading! It’ll help make your putting green decision even easier. Putting green turf face weight: The face weight is the amount of material used per square yard in your artificial grass. The higher the face weight, the tighter the turf pile, which creates an ideal surface for putting. For putting green, the optimal face weight is between 40 and 60 ounces. Putting green turf pile height: Pile height is the thickness of your turf. Putting green should have a low pile height to ensure your ball rolls true. Imagine hacking away in tall grass. Yikes. Most putting green surfaces are ½” thick to ¾” thick. Indoor putting green or outdoor putting green: Most putting greens can be installed indoors and outdoors, but it’s good to check to make sure. For example, indoor putting green might have nylon fibers, which can fade in direct sunlight. You’ll definitely want to check if the turf is UV stable to prevent fading. Putting green turf stimp reading: A stimp reading tells you how fast the ball will roll on putting green. The higher the stimp reading, the faster the ball will roll. Stimp readings can vary depending on how putting green is installed, but most of the stimp readings on our putting green turf is a 9 to 11. 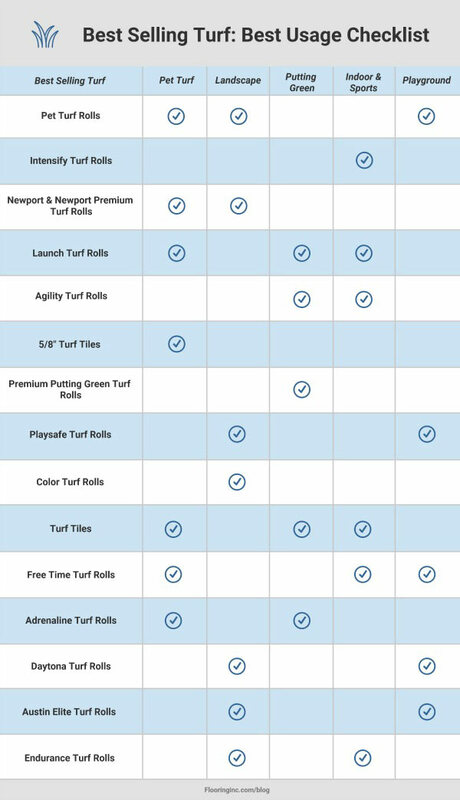 Up-front expense: Buying putting green can have a steep upfront cost, but that also depends on how much area you are dedicating to your golfing zone. Additionally, it lasts for years, so in the long term, it pays for itself. Not all turf needs to be outside. In fact, many gyms use turf to add a new element to their workout! Okay, so that’s not the actual quote, but it makes a good point. Kiddos at play, play hard. They are more than happy to jump, and sometimes fall, from high places. What keeps them from getting hurt? Playground turf is great for under playsets and jungle gyms. With the right padding underneath, you or your kids won’t have to worry about the long drop to the ground. Most fake grass for playgrounds looks like real grass blades. Manufacturers work hard to make artificial grass look and feel more realistic than ever before. 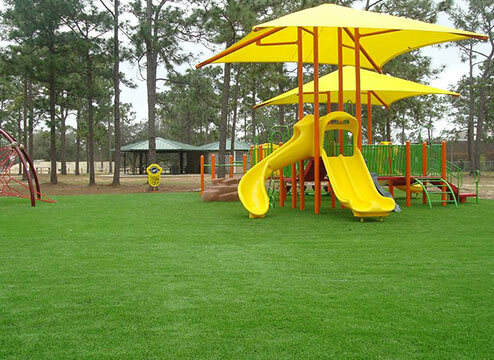 Playground artificial grass often mimics real grasses found throughout the United States. If you have a favorite grass, there’s probably a playground turf that matches it. Playground turf is super UV stable and also heat and frost resistant. It typically has a higher face weight and more durable fibers than other types of turf. It’s built for kids to play and tumble around on it, so it can hold up to those summer afternoons. Both of these factors make playground turf extremely durable for the playground. Does Playground Turf Need Padding? Playground turf fall-height ratings depend on thickness and underlayment. The thickness is measured by adding the thickness of your lawn pad or play pad with the thickness of your playground turf. This is where artificial grass can get a little complicated. At the end of the day, if you live in a hot climate or just want green grass without all the maintenance, artificial grass is the way to go. 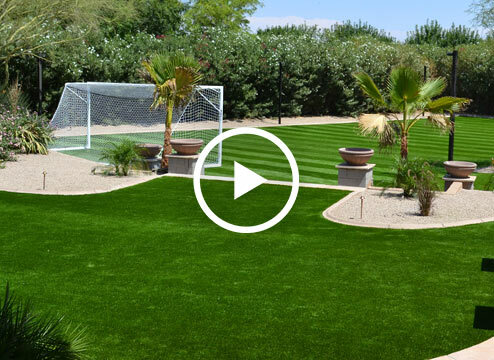 From sports to outdoor play, there’s definitely a grass perfect for your needs. And once you find your perfect turf, make sure you spend plenty of time enjoying it!